SAYBROOK TOWNSHIP – Since she was a teenager, Tina Jackson has been interested in law enforcement. 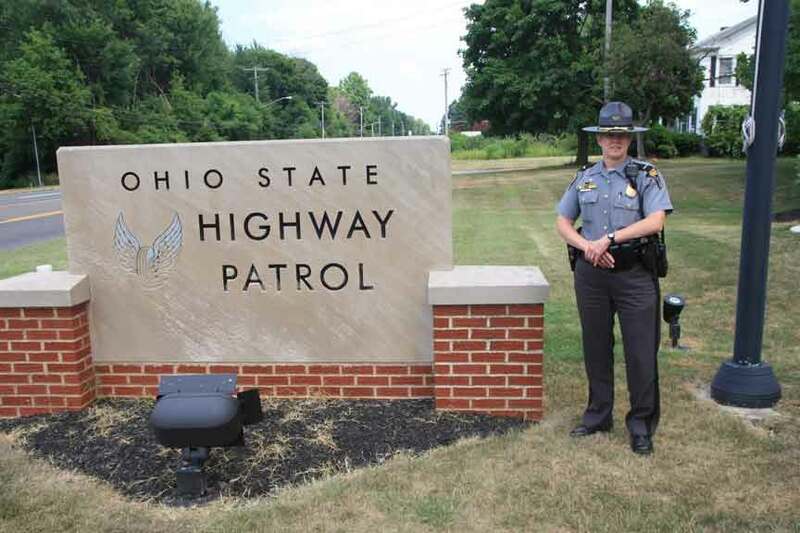 Nearly a quarter-century into her career, she was named commander of the Ashtabula post of the Ohio State Highway Patrol. “I’ve always been interested in law enforcement. When I was a kid at 15, I was involved in the law enforcement explorers program with the sheriff department and I really enjoyed that. “When I turned 21, I got hired on as a deputy sheriff in the Medina County Sheriff’s Department and spent four years there. That’s how I started my career,” SHE SAID. She joined the highway patrol in 1999 and has been there ever since. She says the patrol is interested in the communities it serves. “We like to get on in the community, help other agencies as much as we can,” she said. She joined the Marysville post in 1999. She ended up in Medina and Mansfield, was promoted to sergeant. She worked at the training academy as an instructor for a bit and then transferred to the Ashland post and then was promoted to lieutenant and then was transferred to Ashtabula. “Both are rural. (Ashland) is a smaller county than Ashtabula, area wise it’s a lot smaller. It’s a lot quieter than Ashtabula. We deal with a lot of Amish. We don’t deal with as many crashes,” Jackson said. “The winters, so I hear, are a lot harsher up here,” she said. “Ashland was a very nice county. I enjoyed working in it,” she said. “When I started, most of the impaired drivers I dealt with were alcohol involved. Nowadays we are getting a lot more impaired drivers who are on drugs or drugs and alcohol related. There’s an increase in drugs in general. There’s an increase in heroin,” Jackson said. All troopers carry Narcon, to revive people who overdose. “We cover all of Ashtabula County. We don’t handle anything on private property. You will see us on the roadways, be it on the county highways, the township roads, U.S. routes or interstates. “We do our checkpoints. We make sure we are picking areas where there is an OVI problem, where there are statistics that will show that the areas we do choose show in fact they have problems with OVIs. We let the public know when we are going to do an OVI check. And then we go ahead and conduct one,” Jackson said. “It’s announced ahead of time there’s going to be one and a media release will be issued about where it’s going to be held,” Jackson said. Troopers don’t ask for license and registration. They simply converse enough to assure the driver has not been drinking. “People aren’t prolonged when they go through a checkpoint,” she said. Working in a county with a larger area is a challenge, Jackson said. “I would say because manpower is always a challenge. It’s trying to strategically place them where they will do the most good. Where we have a lot of crashes we typically try to place people in those areas. Where there is a lot of drugs,” she said. “One thing I noticed in this county compared to other counties I worked in is in fatal crashes, they weren’t wearing seatbelts. Which makes me believe not a whole lot of people are wearing them in this county. Why that is, I don’t know. We try to get out there and enforce the seatbelt laws. Cruisers come equipped with computers these days. “When I first came on, video cameras were just coming on. We did not have computers on board. “It makes our jobs easier. It also helps our dispatchers out. Officers can look up a lot of their own stuff. Instead of coming in on post to do all of their paperwork, they can now actually stay out on the road and be seen. They can pull out onto a crossover or parking lot to do their paperwork in their vehicle now, using the computer. “It makes them more visible. The public can see them. It allows them to be off post more,” she said. Troopers have cameras in their vehicles, but not on their person, although she said she would have no trouble with it. “I’m still learning the county. I think it is a beautiful county. I’m still getting out and meeting people. Meeting other agencies,” Jackson said. “I like working with the agencies around here. The sheriff. The police chiefs. There’s a good group of law enforcement agencies in this county,” she said. Tina Jackson has taken command of the Ashtabula post of the Ohio State Highway Patrol.